Operating Era: 1925-1973. Great Northern. GN built 1,050 auto cars in its company shops in 1925-27, 100 of which had full end doors. Some ran into the 1960`s. 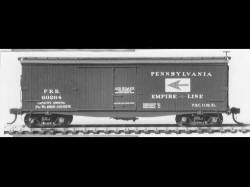 In 1940 all but the full-end door cars were rebuilt into single door box cars. In the 1950`s these cars were given AB brakes and modern appliances. Our kits cover the the cars from building to the scrap heap. Kit series 2800 covers all auto car versions. Kit series 2850 models the box cars; 2850/01 are the car as rebuilt in 1940; kit 2852 models the car with AB brakes and choice of several heralds. 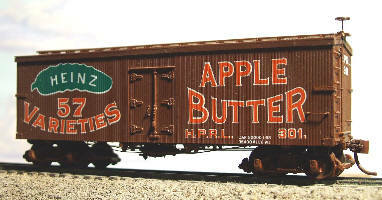 PLEASE SEE OUR SS BOX CAR SECTION FOR OTHER #2800 SERIES KITS.